One of the benefits of doing the Blogathon is that I get to meet tons of other bloggers writing about a wide variety of things. And we swap posts, which is a fun way to make creative connections as well as share knowledge and ideas. This year I was lucky enough to have two swap partners. One of them, Garden to Table, is a great gardening site that I subscribed to even before I met up with her here. It was like meeting someone famous. 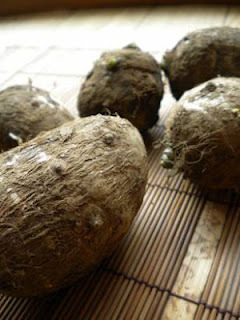 Here at Popcorn Homestead, Elyse wrote about Oregon Farmer's Markets, and over there I talked at length about my growing relationship with satoimo (taro root), one of Japan's favorite slimy foods. Yummier than it sounds!